Precision Net Golf Barrier Nets, Soccer Nets, Baseball, Tennis, Hockey Nets. 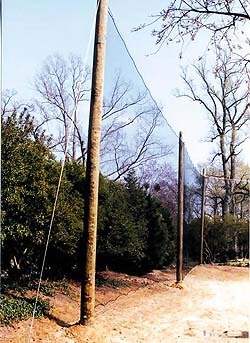 Golf Barrier Nets are made of super-tough nylon netting with a square mesh size of 15/16 inch. Golf Impact Nets are made of #18, 3/4 inch square mesh knotted nylon netting. All nets have a rope border sewn around the perimeter. These nets have a variety of uses, from fairway barriers to backyard catch nets. If you don't see the size net that you need listed here, please call us toll free at: 888 852-4882. We will be happy to discuss building a net to fit your specific needs. Made of super tough nylon netting with a square mesh size of 15/16". All nets have a rope border sewn around the perimeter. These nets have a variety of uses, from fairway barriers to backyard catch nets. 10x20 ft $90.00 $20.00 $110.00 . 10x30 ft $123.00 $25.00 $148.00 . 20x20 ft $154.00 $30.00 $184.00 . 20x40 ft $294.00 $34.00 $328.00 . 20x60 ft $434.00 $49.00 $483.00 . Rugged nets that are designed to stop even the hardest drives. Made of #18, 3/4" square mesh knotted nylon with a rope border sewn around the perimeter. Treated for weather and UV resistance. Please specify black or green when ordering. Please call for a price if the size you want is not listed. 10x15 ft $120 $22.00 $142.00 . 10x20 ft $166 $26.00 $192.00 . 15x20 ft $215 $30.00 $245.00 . 20x20 ft $290 $35.00 $325.00 .